October - December 2012: The IGA archived and digitally remastered the first library archives from the AB collection. More details will be presented as they become available for website. June - July 2012: The IGA partnered with the Light and Glass Society for the Summer 2012 Glassmaking Tour. 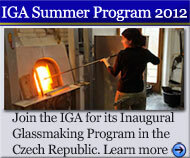 April 2012: The IGA partnered with the Light and Glass Society for its inaugural summer 2012 glassmaking tour in the Czech Republic. The program included tours of the region's three historic glassmaking schools in Nový Bor, Kamenický Šenov and Železný Brod, glass and chandelier factories, artist studios and ateliers, as well as visits to private collections and museums throughout northern Bohemia and Prague. The IGA’s programs seek to support, safeguard and preserve the historic glassmaking schools and the region’s long-standing and rich traditions for future generations by promoting a greater understanding of the region’s glassmaking and education history and its significance to glass and chandelier design throughout the centuries. We hope you enjoyed participating with the IGA and Light and Glass Society in this unique opportunity to explore one of the last intact glassmaking regions in the world! Please view IGA Summer Program 2012 Page to learn more. 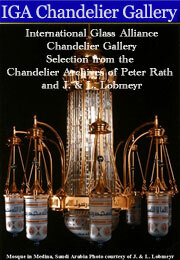 March 2012: International Glass Alliance Czech Glass Donation to the NHU March 21-22, 2012 Auction. Please visit the New Horizons Unlimited (NHU) website for information regarding the IGA donation of Czech glass. The NHU 2012 Annual Spring Raffle and Silent Auction took place on Wednesday and Thursday, March 21-22, 2012 in the US Bank Center Galleria in Milwaukee, WI. If you could not attend or come to this notice late, please view the NHU website for more opportunities of support to this Wisconsin service organization that serves people impacted by challenges via an internationally accessed website and local community initiatives. The NHU 2012 Raffle and Auction met their financial goal with support from those in the community, including IGA. IGA Archive Timeline Beginning: In response to the rising threat of closure to the oldest glassmaking school in the world, the Secondary School of Glassmaking in Kamenický Šenov, International Glass Alliance co-founder Amy Brabender created a petition on behalf of concerned members of the global glass community in support of the historic school remaining open. It was read at a Czech regional public and press meeting in Kamenický Šenov on Dec. 10, 2009. The International Glass Alliance was officially established in the following year, 2010, to continue the effort to preserve the regionʼs glassmaking traditions. The online version of the petition has over 600 signatures from around the world and can be signed at the following website: http://www.ipetitions.com/petition/senovpreservation/. In 2010, the IGA Executive Director, Amy Brabender, and Treasurer, Peter Rath, traveled to the Czech Republic to consult with school faculty, artists, scholars and government officials to create glassmaking educational programs, scholarships to study glassmaking, professional development and both economic and community-based opportunities for Czech students, artists and faculty to participate in sustaining the glassmaking region in northern Bohemia. We are in the process of designing these programs and, as more information becomes available, it will be shared on this website. Financial support for the development of these programs is vital. Please visit the Support Us page to find out how you can support this endeavor today. If you are interested in potential participation, please contact the IGA Executive Director at: director@internationalglassalliance.org. The IGA’s economic and community-based initiatives seek to bridge the glass communities in Madison and the Midwest with those in the Czech Republic. The IGA is in the process of developing programs to support these initiatives and will update the website as these programs become available. In August 2010, the IGA was legally established as a non-profit corporation in the United States. In September 2010, the world-renown glass engraver, Jiří Harcuba, joined the IGA as the Honorary Advisor board member. Please click here to learn more about Jiří's work. The IGA also presented its initial vision statement at the International Conference on the History of Czech Glass and Jewelry, which was held in Železný Brod, CZ, September 17-19, 2010. In October 2010, Js Brielmaier, was invited to generate innovative ideas, provide research, project and development as IGA creative director consultant/advisor. In January 2011, the IGA executive director and creative director met with Debra Karp, Director of Community-Based Scholarship and Nonprofit Development within the Center for Community Partnerships at the University of Wisconsin. Ms. Karp provided insight and expertise for the IGA's pathway toward non-profit development. In February 2011, the IGA partnered with Arts Wisconsin, a non-profit arts organization in Madison, Wisconsin, for a fiscal receivership while its own 501(c)(3) application is processed. 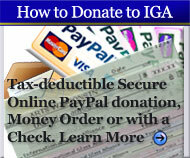 This enables donations to the IGA through Arts Wisconsin to be tax-deductible. Anne Katz, Executive Director of Arts Wisconsin, graciously shared her expertise and encouragement of arts and education advocacy to enhance the goals and initiatives of the IGA. Please click here to learn more and get involved in Arts Wisconsin. Throughout 2011 and now in 2012, the IGA is working to finalize details of its initiatives and programs. As artists, curators, museum and university staff, scholars, gallery owners and collectors, we are all benefactors of the rich glassmaking heritage within the Northern Bohemia and Czech region. With your help, the International Glass Alliance can increase its efforts to preserve glassmaking traditions and promote one of the last functioning glass regions in the world for future generations! Let us join together in this endeavor!